The giant fruits of the jackfruit (Artocarpus heterophyllus) hang from the branches of the 30- to 70-foot-tall tropical tree. Hardy in U.S. Department of Agriculture plant hardiness zones 10 through 12, the evergreen tree is grown as a sun room or greenhouse plant in colder climates. 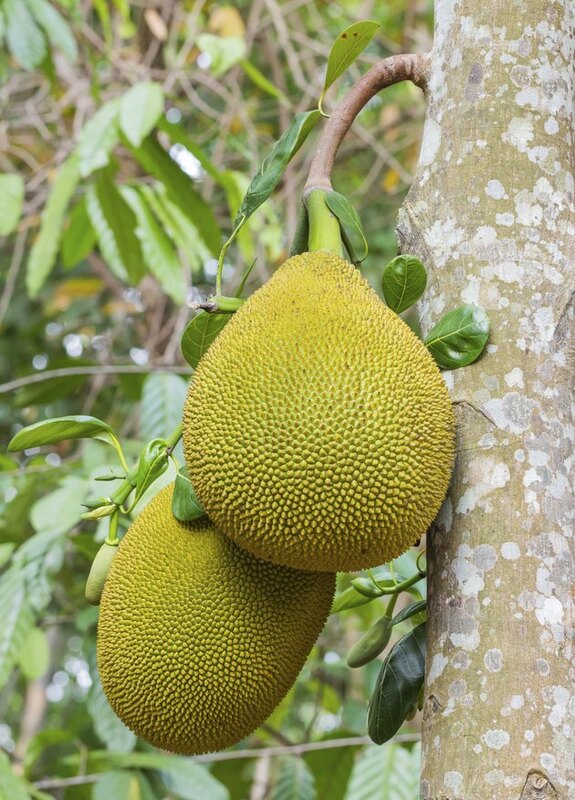 Jackfruit seeds should be planted as soon as possible: no later than 30 days after harvesting from the ripe fruit. Jackfruits weigh up to 80 pounds each when ripe. Harvest the seeds from a fully ripened jackfruit by cutting open the fruit and removing the seeds. Select a known variety of fruit grown on a prolific tree if possible. However, trees grown from seeds may not grow true to the parent tree. Wash the seeds in warm water to remove the surrounding slimy pulp. Select the largest seeds for germination. Plant the seeds immediately, while they're still wet. However, if you must hold the seeds for a few days, gently pat them dry and place in airtight bags or containers. Keep the seeds at 68 degrees Fahrenheit for up to 30 days. Soak dried seeds for 24 hours in lukewarm water. To increase the germination rate, use a gibberellic acid solution instead of plain water. Mix one 100-milligram packet of powdered gibberellic acid with one teaspoon of rubbing alcohol. When the powder is completely dissolved, mix the solution with 13 to 14 tablespoons of water. Moisten sterile seed-starting mix with warm water. Put the mix into peat pots, toilet paper rolls or other biodegradable pots on a tray. The peat pots allow you to transplant them without disturbing the jackfruit seedling's tender tap root. Place one seed into each pot, barely covering it with moist seed-starting mix. Cover the pots with plastic wrap to maintain a humid atmosphere. Put the tray of starting pots on a root warming mat or in a warm location where the temperatures are maintained at 80 to 90 degrees Fahrenheit. Allow 10 to 40 days for germination. Monitor the seed-starting pots to ensure that the mix remains slightly moist at all times. Remove the plastic and mist with water as needed to keep the seed-starting mix evenly moist. Keep plastic wrap over the pots until the seeds germinate, then remove it. Water the seedlings regularly, when the soil is dry to the touch. Add water until the excess drains from the bottom of the pot. Select a warm, sunny, sheltered location where the soil is well-drained for outdoor trees. Transplant seedlings in late spring or summer, when the weather is warm. Dig a hole three times the width and the same depth as the root ball. Carefully place the biodegradable pot with the seedling in the hole. Backfill with the excavated soil. Gently tamp the soil, then water thoroughly to remove any air pockets. Place potted jackfruit trees in brightly lit locations where they aren't affected by drafts from heating and air conditioning systems. Use a warm steam vaporizer to maintain a humid atmosphere around the tree. Water the jackfruit tree once or twice a week, when the soil is dry to a depth of 2 to 3 inches. Apply 10 gallons of water for each inch of the jackfruit trunk's diameter. Potted trees should be watered until water drains from the bottom of the planter. Rake 4 inches of mulch over the soil around the tree, pulling it back 3 to 4 inches from the trunk. Mulch conserves water by reducing evaporation from the soil, ensuring a consistent level of moisture. Prune in late summer or early fall, when the tree's growth slows. Prune only to shape the jackfruit tree and remove dead or crossing branches. Disinfect the anvil pruners between each cut with a solution make up of equal parts of water and rubbing alcohol. Fertilize indoor trees with a balanced 6-6-6 fertilizer, scratching 1/8 to 1/4 teaspoon into the soil monthly. Fertilize outdoor trees with a 6-6-6 or 8-3-9 fertilizer every four to six weeks. Apply 1/2 pound for each inch of the trunk's diameter, scattering it over the soil under the tree's canopy out to the drip line, then scratching it in to a depth of 2 to 3 inches. Monitor the jackfruit seedlings for brown or reddish bumpy insects called scales. Remove scales by rubbing the pest carefully with cotton swabs soaked in rubbing alcohol. Severe infestations may be treated with a horticultural oil product, such as neem oil. Mix 2 tablespoons of neem oil concentrate with 1 gallon of water. Spray the tree until the branches, twigs and underside of the leaves are wet, but not dripping. Repeat every seven to 14 days as needed.